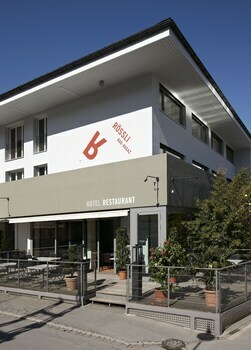 With a stay at Hotel Roessli in Bad Ragaz, you'll be a 1-minute walk from Swiss Alps and 9 minutes by foot from Tamina Thermal Baths. Free self parking is available onsite. When you stay at this apartment in Grindelwald, you'll be near ski lifts and minutes from Pfingstegg Cable Car and Pringsteggbahn. Free self parking is available onsite. With a stay at Hotel Altein in Arosa, you'll be in the mountains, just a 1-minute walk from Swiss Alps and 6 minutes by foot from Obersee Park. Self parking (subject to charges) is available onsite. When you a stay at Blockhaus Erezsäss in Klosters-Serneus, you'll be near ski lifts, just steps from Swiss Alps and Davos Klosters. The front desk is staffed during limited hours. When you stay at Hôtel du Grand-Pré in Marly, you'll be in the suburbs, within a 5-minute drive of Botanical Garden and Museum of Natural History. Free self parking is available onsite.